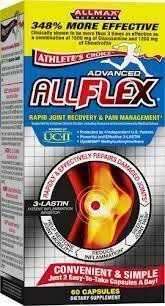 Directions For Universal Animal Flex: Take one pack per day, either on an empty stomach or with a meal. World’s Highest Quality & Most Complete Joint Support Pack Ever Developed! PharmaFreak FLEX FREAK™ PACKS are engineered to provide your body with the absolute highest-quality and most complete joint support formula available! PharmaFreak FLEX FREAK’s gold-standard formula is designed to optimize every aspect of joint health and to allow your body to perform at its best! 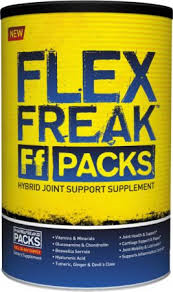 FLEX FREAK™ is really more like 2 or 3 joint products combined into one ultimate formula! 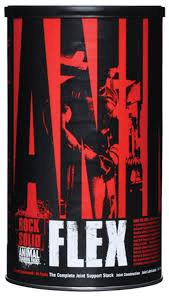 PharmaFreak Flex Freak ACCURATE DOSING GUARANTEED! To ensure accurate dosing of every ingredient in each FLEX FREAK Pack, the 6 different ingredient complexes are strategically divided into 2 blue tablets, 4 white tablets, and 2 yellow tabs. Using this 3 color coding system ensures that the accuracy of the ingredient dosages are maintained throughout the entire manufacturing process right up until the packs are sealed in air- tight canisters. GI tract for optimal absorption. Microcrystalline Cellulose, Phosphate Dicalcium, Stearic Acid, Croscarmellose Sodium, Gelatin, Magnesium Stearate, Silicon Dioxide, Hypromellose (USP 2910), Polyethylene Glycol (PEG 8000), Titanium Dioxide, Talc, Blue No. 1, Yellow No. 6. Allergy Information: Contains Ingredient Derived From Shellfish (Shrimp). Persons With A Known Allergy To Shellfish Should Not Use This Product. Working out hard leads to a depletion of your glycogen levels, this can lead to slow recovery times and decreased protein synthesis. Taking a good ratio of carbs to proteins can effectively help reverse this process by increasing your glycogen and protein synthesis. This promoted a health anabolic environment to grow and recover faster. High intensity weight training will increase catabolic hormones that cause muscle damage, and hindering your rate of muscle growth. 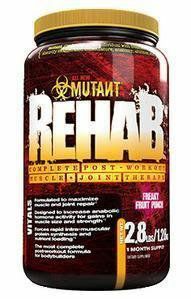 Mutant Rehab is designed to reverse your body from a catabolic state back into an anabolic growth state by stimulating your bodies’ insulin. Lifting heavy weights or repetitive movements can do lots of damage to your joints. This product contains a clinical dose of Glucosamine and other much needed compounds for joint health and effective rebuilding of the soft tissues associated with your joints. For best results you will want to take 1 serving (which is 2 scoops) right after your workout. Make sure you hydrate yourself well and mix it with 12 to 16 ounces of cold water.